Science teachers wanting to teach their students about the changing ways of weather could find themselves with an interesting teaching aid this spring. Crowdsourced weather startup BloomSky plans to give away 10,000 internet-connected weather probes to schools and parks when they’re ready to start shipping in the second quarter. I first wrote about BloomSky’s proposed weather-tracking network July when it launched a crowdfunding campaign for its hardware on Kickstarter. The module combines temperature, barometric pressure, rainfall, humidity and UV-light sensors and comes embedded with a camera that regularly photographs the horizon. 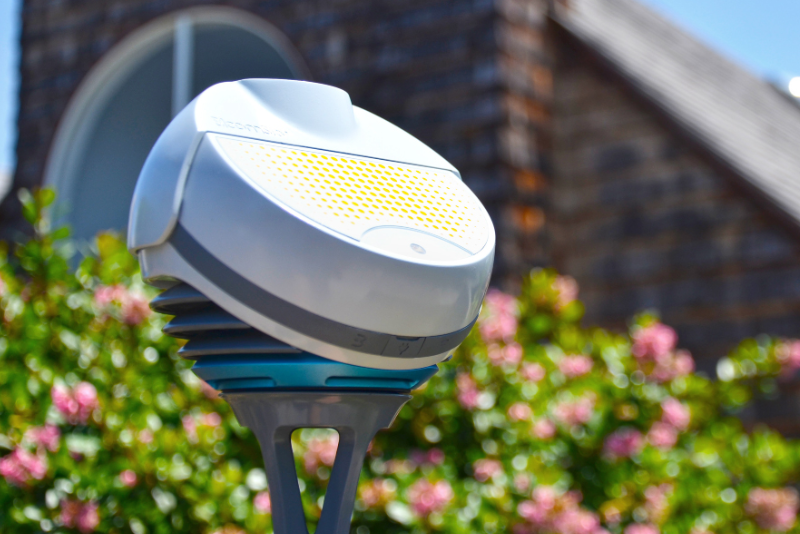 The gadget connects to your Wi-Fi network, where it provides a live feed of your backyard environmental conditions for anyone to see if you choose to share it. The data BloomSky collects, however, is all fed into its crowdsourced weather map. The campaign easily surpassed its $75,000 goal, raising $128,000 in total, and BloomSky said it’s now on track to start selling the $149 device next year. Getting the free probes into schoolyards and playgrounds, however, is more than just charity. BloomSky wants to create a crowdsourced meteorological network with the ambitious of goal of tracking weather patterns on a neighborhood-by-neighborhood and even block-by-block basis. To do that it needs to seed communities with its whether probe so it can start collecting baseline data as well as offer live feeds of weather probes for prospective customers to see. In other words, in order to build a network, it first needs to build a network. According to BloomSky, approaching local schools and park districts is an ideal way to begin. It’s already started a similar project in San Francisco where it’s given out 80 free probes to everyday residents in its different neighborhoods. By spacing the probes out in different city neighborhoods and communities in the Bay Area it’s trying to compare the variations between San Francisco’s famous microclimates. BloomSky Marketing Manager Samuel Chow told me that there are no restrictions or requirements for any school or park district that wants to apply on its website. BloomSky will assign the probes on a first-come first serve basis, and a school administrator or park manager need not be the applicant. Teachers, students, parents and community residents can sign up for the program at the behest of their local school or park, Chow said. Probe image courtesy of BloomSky.